UDM Downloads > GdPicture Light Image Processing Toolkit! 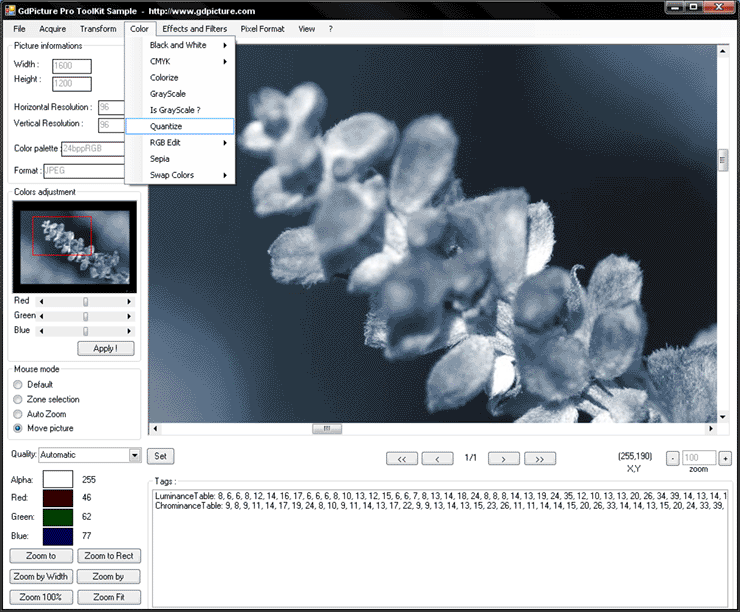 GdPicture Imaging SDK is an image processing toolkit to acquire, create, edit, and compose bitmap images. It can read, convert, print and write images in a large variety of formats. GdPicture Imaging SDK can be used from any 32 or 64 bit Windows development environment that can call ActiveX components, including Visual Basic, Visual C++, Delphi, Visual FoxPro, PowerBuilder, PHP, ASP, IIS, MS Word, Access, Windev, Excel, .NET environment like C#, VB.NET and many others. GdPicture Imaging SDK works with Microsoft Windows platforms: 98, NT4, ME, 2000, XP, 2003, Vista... * Royalty free. * Easy to use API. * Frequents updates. * Many sample codes. * Forum support. Few specifications: - Support for tiff, tif, jpeg, jpg, png, ico, wmf, gif, exif, bmp, j2k, fax, emf... and PDF file formats. - Support lzw, ccitt3, ccitt4, rle and Jpeg compression. - Support for 1bit, 4bits, 8bits, 16bits, 24bits, 32bits, 48bits and 64bits pallets color. - Multipage Tiff reading and writing. - Drawing barcode (25i, EAN13, 3 of 9) - Image enhancement functions. - Import / Export from clipboard. - TWAIN scanning (scanner and webcam) with Automatic Document Feeder control (ADF) and Auto-Scan. - Pallets colors conversion. - Auto Border removal. - Advanced rotations. - Watermark. - Advanced Text processing. - Make Thumbnails. - Skew and de-skew image. - Obtain specific color components of an image. - Read / Write EXIF, Thumbnail, GPS Tags... - Print image. - Merge and combine Images. - Resizing with 8 diferent interpolation modes. - Drawing lines, ellips, round, bezier, curves... - Change brightness, saturation, contrast, gamma. - Lot of filters and effects (emboss, blur, engrave, smooth, negative, red eyes correction...). - Personalized filters with black and white images. - Area processing. - Capture the contents of any window or section of any window. - Color anti-aliasing and smoothing for zoomed images.